While sales for large crossovers and SUVs continue to rise, many car shoppers are still interested in fuel-efficient models that help to save money each week at the gas pump. The Toyota lineup is arguably the most fuel conscious with a variety of hybrid models in different body styles including popular crossover and SUV options big enough to haul the whole family. 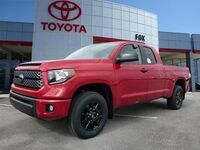 Vehicle shoppers interested in leasing or purchasing a new or used fuel-conscious Toyota can find the current lineup and a variety of used selections available at Fox Toyota in Clinton, TN near Knoxville. If you aren’t sure of which Toyota model is the right fit for your needs, our team can help! They’re great at pairing the right customer with the right vehicle and are available on the lot during normal business hours to answer questions, help with research, or set up test drive appointments. Stop by today or give us a call at 865-407-2245 and let us know what you are looking for! For most vehicle shoppers, the research and browsing process begins online. At Fox Toyota, we try and make it as easy as possible for our customers to see our current inventory. Our easy-to-search online inventory pages are updated daily and are a great tool for shoppers who want to browse available models in the Knoxville area before heading out to the dealership for in-person research and test drives. Connect with the Fox Toyota team via the pop-up form below, browse our current hybrid inventory online, or head over to the dealership for a more personal experience!